Annemarie Schimmel, The Mystery of Numbers (1994), Oxford University Press, ISBN: 0195089197 Why is the number 7 lucky even holy in almost every culture? Why do cats have 9 lives? Why is 13 unlucky? Why does Lent last for 40 days? From literature to folklore to private superstitions, numbers play a conspicuous role in our daily lives. In this fascinating book, Schimmel (Professor of Islamic Culture at Harvard) shows that numbers have been filled with mystery and meaning since the earliest times, and in every society. She shows that number symbolism has deep roots in Western culture, from Pythagorean & Platonic philosophy to Cabala mysticism and the Islamic Brethren of Purity. The author examines individual numbers ranging from one to 10,000 discussing the meanings they have had for Judaic, Christian, and Islamic traditions, with examples from Indian, Chinese, and Native American cultures as well. I agree with the New York Times Book Review: By the time you finish this entertaining yet scholarly book, you'll not only be in seventh heaven, you'll understand why you are. The book is profusely illustrated with 45 halftones and 64 woodcuts that add to our understanding of number symbolism. This is a great reference book that's fun to read. Richard Phillips, Numbers: Facts, Figures and Fiction (1995), Cambridge University Press, ISBN: 0521464811 Have you ever wondered how 7-UP got its name, or how Henry Heinz chose 57 Varieties? You will find the answers in Numbers: Facts, Figures and Fiction. This book is full of facts, both mathematical and cultural, tantalizing problems and anecdotes. It's a colorful book with beautiful graphic layouts, fun to browse in or to study when you wish to delve more deeply about a certain number. The numbers from 0 to 156 each get an entry, with a briefer mention for all the numbers up to 1000. In these pages, the author juxtaposes mathematical facts with rules of games, bingo calls, film titles, and trademarks. There are puzzles and questions on many of the numbers with answers at the end of the book. I love the author's humor suggesting that a millihelen as the amount of beauty that would launch a single ship. Whatever your taste whether you want to count the stars or count the ways, you'll find something illuminating in this book. R. A. Schwaller De Lubicz, A Study of Numbers: A Guide to the Constant Creation of the Universe (1986), Inner Traditions, ISBN: 0892811129 Without direct awareness of Space or Time, human beings lack the two senses necessary for the knowledge of all causes. The result is that the science of numbers, the most wonderful guide to the constant creation of the universe, remains an enormous hypothesis so long as its use has not awakened in us the higher consciousness of a universal order. By deepened knowledge of things and their process of becoming, we must come to recognize Numbers as a truth, and to experience with our senses the living relation of a cause to an effect, this relation being truer and more real than the effect could ever be. First published in 1917, A Study of Numbers is a masterly account of the living, universal, qualitative, and causal reality of numbers. Starting from the irreducible one, Schwaller deals with the unfolding of creation through the cycles of polarization, ideation, and formation. Topics covered include: numbers, values, and relations; disengagement of numbers; harmonic basis of numbers; development of values; and establishment of harmony. Ian Stewart, Nature's Numbers: The Unreal Reality of Mathematics (1995), Basic Books, ISBN: 0465072747 Why do many flowers have five or eight petals, but very few have six or seven? Why do snowflakes have six-fold symmetry? Why do tigers have stripes, but leopards spots? Science writer Ian Stewart suggests mathematical regularities in natural forms and explains why math is the best tool yet for understanding the world around us. Mathematics has the power to open our eyes to new and unsuspected regularities: the secret structure of a cloud or the hidden rhythms of the weather. It can look at a single snowflake and deduce the atomic structure of ice crystals. It can start with a violin string and uncover the existence of radio waves. Nature's Numberwill equip you with a mathematician's eyes. It will take you sightseeing in a mathematical universe, and it will change the way you view your own world. Keith J. Devlin, Life by the Numbers (1999), Wiley, ISBN: 0471328227 Why do leopards grow spots when tigers grow stripes? Is the universe round, square, or some other shape? How do a golf ball's dimples give it greater lift? Only one tool of the human mind has the power and versatility to answer so many questions mathematics. In this fascinating book, Keith Devlin reveals the astonishing range of creative and powerful ways in which scientists, artists,athletes, medical researchers, and many others are using mathematics to explore our world and to enhance our lives. You'll find delightful nuggets in each of the eight chapters: Invisible Universe, Seeing is Believing, Patterns of Nature, Numbers Game, Shape of the World, Chances of a Lifetime, A New Age, It's an M World. Lavishly illustrated with over 160 photos, this book deliberately leaves out equations and formulae, yet it imparts a sense of wonderment and the sheer fun of seeing our world through mathematical eyes. Martin Gardner, The Magic Numbers of Dr. Matrix (1985), Prometheus Books; ISBN: 0879752823 The author brings together in this book all his Scientific American columns on Dr. Irving Joshua Matrix, considered by many to be the greatest numerologist of all time. He was the first to reveal that the computer HAL in Kubrick's 2001 is obtained by shifting each letter of IBM back one letter in the alphabet. Dr. Matrix tells Gardner: Numbers have a mysterious life of their own. As you delve into his secret world you'll master some significant combinatorial math and number theory. Dr. Matrix challenges us with many remarkable puzzles, which are clearly answered in the back of the book, together with commentary and references by Gardner to enlighten the uninitiated. My favorite chapter in this book is on numerology of the King James Bible. Dr. Matrix proves that Methuselah died in the very year of the Flood at age 969. He even comes up with 3.1416 for pi based on I Kings 7:23. 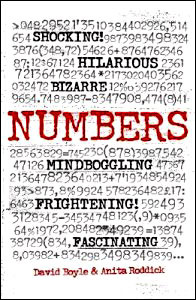 David Boyle & Anita Roddick, Numbers (2004), Chelsea Green Publishing; ISBN: 0954395921 Numbers can unlock secrets, split atoms, reveal the inner workings of people and machines, or draw patterns of jaw-dropping complexity and beauty. In the East, they have mystical significance they can tell the future and are the key to the secret harmonies of the universe. Numbers can also make us angry, make us laugh, or elicit tears. Did you know that 3.7 million Americans claim to have been abducted by aliens? While numbers can reveal, they can also conceal. Numbers can be convincing liars. This book encourages a healthy skepticism toward those who would have us quantify the universe and all its minutiae, including our own humanity. This is a collection of some of the most peculiar, bizarre, shocking, or hilarious numbers we could find. They are meant to make you think, to challenge your assumptions (and your credulity), to make you laugh, to move you to action, or simply to entertain. This book also offers a glimpse into the history of humanity's fascination with numbers and how our relationship with them ultimately reveals how we relate to each other and our world. 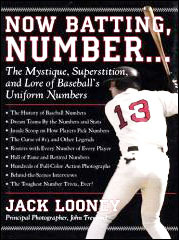 Superstition, and Lore of Baseball's Uniform Numbers (2006), Black Dog & Leventhal Publishers; ISBN: 1579125751 In Now Batting, Number..., baseball historian Jack Looney reveals the little-known facts and nuances behind the numbers players wear on their backs. At the center of the book is a substantial section listing the complete rosters of all 30 Major League teams including each player's number and position. Other lists include every retired number listed by league and team, every retired number listed by position, and famous players' numbers and every other player who ever honored them by wearing that number (listed by number). Chapters include "Boyhood Idols" (players who chose numbers to honor heroes, fathers, grandfathers, and friends), "Birthday Babes" (players who have worn the same number as their day, month, or year of birth), and "Early Innings" (the history of numbering in Major League baseball). 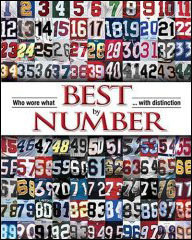 Sporting News, Best By Number: Who Wore What With Distinction (2006), Sporting News; ISBN: 0892048484 The colorfully illustrated book takes you behind the scenes with amazing anecdotes of why players chose or were assigned their famous numbers, but most important, Sporting News tells you authoritatively who was the best of the best, 0-99, including what are sure to be surprise selections that will be debated for years. Yankee fans know that the uniform #3, 4, 5, 7, 8 belonging to Ruth, Gehrig, DiMaggio, Mantle, and Berra are all retired. Football fans know Joe Montana, Steve Young, and Jerry Rice wore #16, #8, and #80 playing for the San Francisco 49ers. Numbers have been a part of sports lore since they first appeared on uniforms back in the Roaring 20s. But who's the best player ever to wear #32. Or who's the best 44: Reggie Jackson, Hank Aaron or Jerry West? Sporting News, which has 120 years of covering sports as a foundation, makes those decisions in the highly-entertaining book Best by Number. 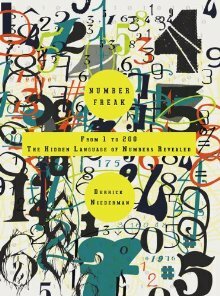 Derrick Niederman, Number Freak: From 1 to 200 The Hidden Language of Numbers Revealed (2009), Perigee Trade; ISBN: 0399534598 Mathematician Derrick Niederman takes readers on a guided tour of the numbers 1 to 200 covering everything from basic mathematical principles to ancient unsolved theorems, from sublime theory to delightfully arcane trivia. Illustrated with diagrams, drawings, and photographs, plus 50 challenging mathematical brainteasers (with answers), this book will fascinate and engage readers of all levels of mathematical skill and knowledge. Includes such gems as:  There are 42 eyes in a deck of cards, and 42 dots on a pair of dice.  In order to fill in a map so that neighboring regions never get the same color, one never needs more than four colors.